The word secutor in English means chaser, and this ancient gladiator got its name from his style of fighting literally because he chased his opponent around the arena. Another interpretation of the name of the secutor gladiator lies in its symbolism of the God of Fire, Vulcan. This symbolism therefore meant that this type of gladiator was paired with The retiarius whose weapons symbolise The God of the Sea Neptune and possessed a trident and a net. The fight between the secutor and the retiarius therefore represented the forces of water versus fire, and this was a common theme in the Roman gladiators for the battles to have what you might call back stories. Very distinct in their look and style this gladiator was recognisable by their heavy armour and large rectangular shield known as a scutum. Their oval helmet was another key feature which had only tiny eye holes to protect their face from the retiarius’s attacks. A secutor pushing into his opponent to get them off balance. The secutor gladiator was armed in a fairly standard fashion and carried a short sword which was known as a gladius. The standard bladed weapon of the Roman military the gladius was a great general purpose weapon, capable of a wide variety of attack, but it was likely the secutor use lots of thrusting attacks once they were able to close the distance on their foes. The secutor was well recognised for the rounded oval helmet they wore, which only had two tiny holes for visibility to avoid being injured by the retiarius’ trident as he strikes towards the face. The rounded top that bears no crest was designed to avoid getting entangled by the net and avoiding unnecessary disadvantage and foothold from the opponent. Protecting his neck was a series of fish fin looking circles smoothed for the same purpose. All this protection was quite a weight in itself, and in the heat of battle would be a lot of heavy metal to carry around. 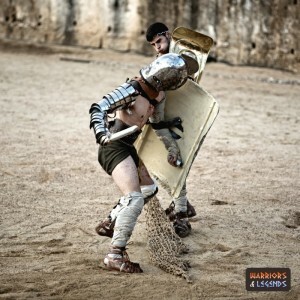 This meant that the secutor may tire quickly in the battle or even lose his breath due to the constrictions of his Armour, so ideally this gladiator needed to win fast. Around his waist the secutor would wear a wide belt and a loincloth to protect his mid-section. However this would not have withstood a serious attack from a bladed weapon, and the secutor would position his shield strategically to protect his mid section. He wore a manica protecting his right arm which was typically fashioned from either metal or leather armour. and this mean that his arm would have some protection when making strikes with his weapons. Finally his left leg which was exposed beneath the shield, was guarded by an Ocrea a metal or leather greave. As we have already mentioned, the secutor was typically pitted against the retiarius, and it’s not thought they fought any other gladiators. 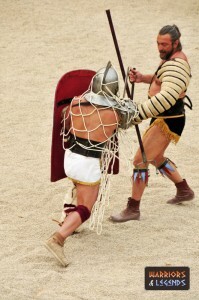 The goal to survive for the secutor was to attack the retiarius using his shield for cover and avoid his net. The secutor would ideally try to finish the battle quickly before his helmet tired him out due to the constriction it poses on his breathing. Most importantly though at all costs, he must avoid being tangled with the net and to always be on guard with his shield against the retiarius’ trident. As long as the secutor avoids these, the opportunity for him to get close a deal a fight ending thrusting blow would exist. Designed with a fairly standard set of weapons and armour the secutor has a couple of unique features to allow them to effectively fight the retiarius gladiator. The smooth topped helmet to avoid snagging on a net and the small eye holes to protect from a trident offered a good protection to the sector’s head. The goal of the secutor would be to keep agile, they weren’t the most heavily armoured gladiator and could therefore move fast which would be needed to evade the net and trident of those foes, and then sneak out from behind their shield to land a damaging blow themselves.